Yup. It’s that time again. Shtinky and I have decided in order to get the ball rolling another challenge is in order. A SPECIAL K CHALLENGE. 1)Breakfast-enjoy a bowl of any Special K cereal with 2/3’s cup skim milk (you can also substitute the Special K cereal of your choice with waffles or granola.) Accompany with some fruit and some juice or coffee for a delectable treat. Do this for two weeks..and watch 6 lbs melt off your body! I looked on the back of the box and found Gluten, high fructose corn syrup, and sugar, but…..not to be a complete Debby Downer..I did notice some corn/wheat/and vitamins as well…and I’m sure with the decrease in calorie intake as well as fat…that this challenge really could work. So this Tuesday Brenna and I will ring in the beginning of our REAL TRAINING (since..we are now OFFICIALLY signed up for the 2010 CHICAGO TRIATHLON) with a challenge that we can actually stick to. So stick that in your pipe and smoke it! This week Shmelly and I are going to attempt to clean our nasal passages and clear our sinus with the wonderful neti pot. Even though the Big O has spoken about this, it’s my kleenex toting bff Colleen that suggested Shmelly and try it out (and for doing so will get some awesome swag!). Ear, nose, and throat surgeons recommend nasal irrigation with a Neti pot or other method for their patients who’ve undergone sinus surgery, to clear away crusting in the nasal passages. Many patients with chronic sinus symptoms from bacterial infections, allergies, and environmental irritants also have begun to regularly use the Neti pot or other nasal irrigation devices, claiming that these devices alleviate congestion, facial pain and pressure, and reduce the need for antibiotics and nasal sprays. Research backs up these claims, finding that nasal irrigation can be an effective way to relieve sinus symptoms when used along with standard sinus treatments. 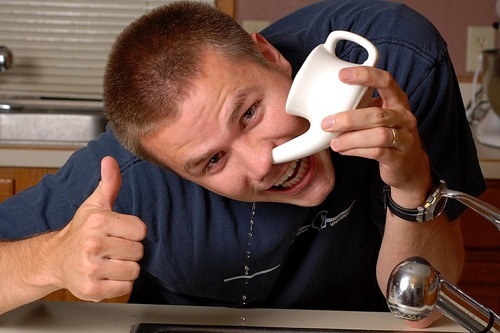 The basic explanation of how the Neti pot works is that it thins mucus to help flush it out of the nasal passages, according to David Rabago, MD, assistant professor in the University of Wisconsin School of Medicine and Public Health and a leading researcher on nasal irrigation. A more biological explanation for how the Neti pot works has to do with tiny, hair-like structures called cilia that line the inside of the nasal and sinus cavities. These cilia wave back and forth to push mucus either to the back of the throat where it can be swallowed, or to the nose to be blown out. “Chronic sinus problems cause the cilia to beat in a slow and uncoordinated way,” Rabago explains. Saline solution can help increase the speed and improve coordination of the cilia so that they may more effectively remove the bacteria, allergens, and other irritants that cause sinus problems, he says. Very curious to see if this helps out my sinus situation. So bottom’s up or through the nose! 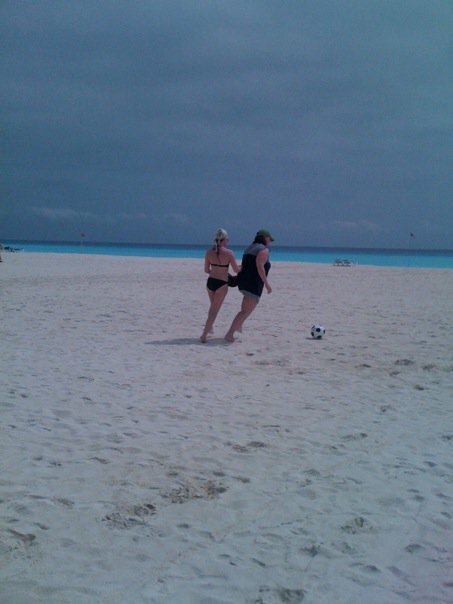 Just a little beach soccer…. 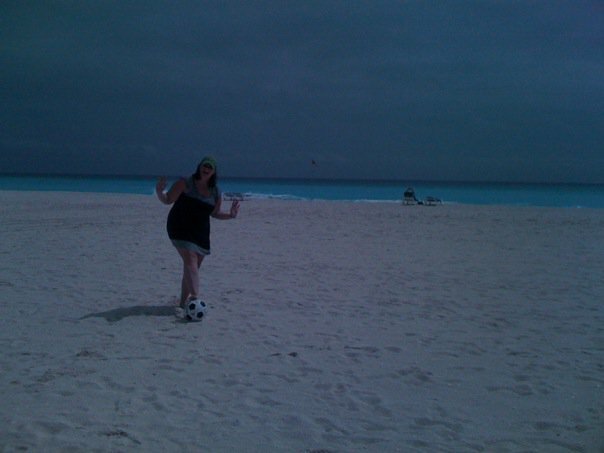 Thanks to my motivated travel companions I was able to play a little game of beach soccer. For a country that loves this sport I didn’t see anyone kicking a ball around, which was probably a good thing because Erin and I really looked like we had some serious skills!